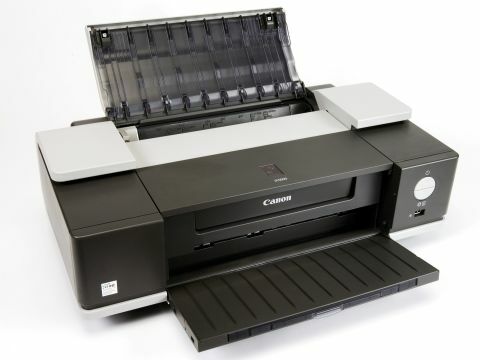 Canon has been aggressively trying to force its way into the printer market space more usually associated with Epson: this new A3 printer seems to be part of the Canon masterplan to cover all the bases. Further up the range, there's also a new ten-ink model for the graphics and art print markets. But the ix5000 is pitched at a different market - businesses that need speedy on-site photo printing. It's currently the cheapest A3 printer you can buy, so it's hard not to wonder where compromises have been made. Build quality is basic, with all-plastic parts apart from the print bed. Visually this is an unexciting printer, opting for a corporate and boxy combination of black and beige. The footprint is a touch smaller than that of competing A3 printers, which will be good news in an office - although 'small' and 'A3' don't quite go together. The supplied software offers the usual selection of variously useful fillerware, some of which starts with an 'Easy' tag: Easy-WebPrint, Easy-PhotoPrint, and so on. This handholds beginners, but anyone with more experience will bin it immediately. More useful are the Noise Reduction and Image Optimiser utilities, which do their best to squeeze the greatest detail from a print. The 2pl nozzle set with a nominal resolution of 4,800dpi helps with this. The most obvious evidence of cost-cutting in the ix5000 is the minimal ink selection, a standard four-ink CMYK set. Although Canon is pitching this as a portable photolab, our tests suggest that this four-ink process struggles with ultimate colour punch and fine shading, creating slightly muddy cyan and magenta tones. It's fine for snaps, posters and promotional materials - and that includes useful extras such as t-shirt and mouse mat printing, which can be arranged with special Canon materials. But it's a little out of its depth trying to produce the very best quality photo output. However, it is fast, producing A3 prints in less than three minutes.